Medical Billers are an important part of the medical office team! 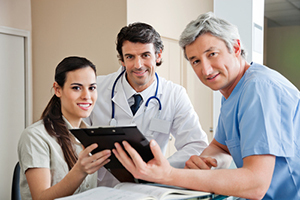 The work of the Medical Biller contributes greatly to the overall group. Think about it! It is the responsibility of the Medical Biller to see that the billing process works well so that the entire office staff is paid appropriately for the work done. As a valuable team member, you’ll enjoy networking with your coworkers as your tasks and responsibilities merge throughout the day. Opportunities for advancement naturally find those who have first-rate skills and a pleasant disposition. We’ll help you develop the skills and work habits that will get your work the positive attention you deserve. Enroll today! Become part of the medical office team! All books and materials for the medical billing program are included. Call us at 405-721-3555 now for more information about medical billing. If you prefer, write linda@andrewsschool.com with your questions about getting started toward your career in medical billing. When you write or call, let us know how you heard about us. We'd like to know if you were referred by a medical billing employer, one of our successful graduates, or an online search.